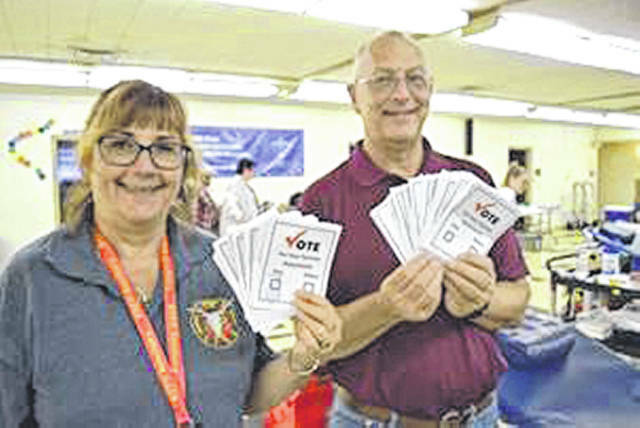 Submitted photo Beavercreek Township Fire Department Auxiliary organizer Pat Cochran and Peace Lutheran Church blood drive coordinator Dan Jessup hold ballots from last year’s drive. BEAVERCREEK — Organizers are asking for help filling the schedule for the Fifth Annual Beavercreek Battle of the Badges Blood Drive 3-7 p.m. Monday, Aug. 6 at the Peace Lutheran Church Fellowship Hall, 3530 Dayton-Xenia Road. Everyone who registers to donate can help decide the challenge champion by voting for the Beavercreek Police Department or the Beavercreek Township Fire Department. Pat Cochran, blood drive organizer for the Beavercreek Township Fire Department Auxiliary, is challenging donors to “Let’s be brave together” to help people like her friend Dennis Seger, who depends on blood transfusions in his ongoing battle with cancer. “The blood transfusions I received during my chemotherapy treatment were a very vital and important part of my so far successful journey,” said Seger. “As this was the first time I have ever received blood it was amazing how much better I felt after I received it. The Beavercreek Township Firefighters are the defending champions of this friendly competition. The blood drive’s four-year total is now 442 registrations to donate and 362 blood donations. The “Battle of Badges” will feature fire house chili and cop shop donuts in the Donor Café. The CBC “LAB” Learning About Blood mobile classroom will be at the blood drive. Everyone who registers to donate will receive the “We Are the Brave – We Are Blood Donors” T-shirt, and will be automatically entered in the “Build a Better Blood Supply Summer Blood Drive” drawing to win a $5,000 home improvement gift card. Participants must be 18 by the Sept. 1 end of the campaign to win. Community Blood Center encourages donors to schedule an appointment online at www.DonorTime.com or call 800-388-GIVE. https://www.beavercreeknewscurrent.com/wp-content/uploads/sites/49/2018/08/web1_battle.jpgSubmitted photo Beavercreek Township Fire Department Auxiliary organizer Pat Cochran and Peace Lutheran Church blood drive coordinator Dan Jessup hold ballots from last year’s drive.